Surprising to some - well actually, surprising to us as well! But, surprising as it may be, we do get asked, from time to time, to make more contemporary styled pieces. We can only deduce that our clients are so impressed with the standard of craftsmanship, they trust us to veer away from our normal field of period furniture excellence, to the modern equivalent. Judging also by the calibre of client, similar to our period oak enthusiasts, they yearn for British handmade and something a little bit different and a lot more personal, than the homogeneous mass produced Far Eastern imports, we see everywhere today. 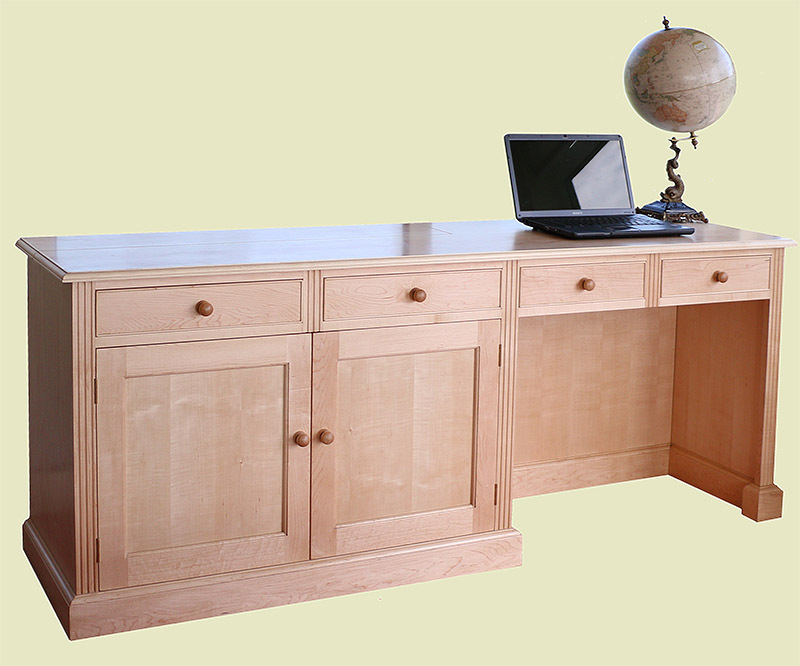 The photo above shows a desk, made from solid and veneered maple. Our client wanted well figured grain for the timber and generally, the best pieces are reserved for veneers. When we talk about veneers, they are not the thin type normally associated with the local timber merchant. These are thick veneers that our workshops buy in separately and apply to mdf board, on a massive purpose made veneer press. The boards are edged with solid wood (NOT iron-on edging), and are thick enough to be spoke-shaved, as if it were solid throughout. But the advantage here, apart from getting the pick of the best grain pattern, is the long term stability of the material. No danger of shrinkage or warping. In fact, what we have here, is genuine cabinet work, which largely replaced joined furniture for the 'well to do', in the 18th century. The bare bones design and dimensions of the piece, came from our client, and we worked together to fine tune the details. But the hidden surprise in this desk, is that it also houses a large flat screen TV. As you can see in the photo below. 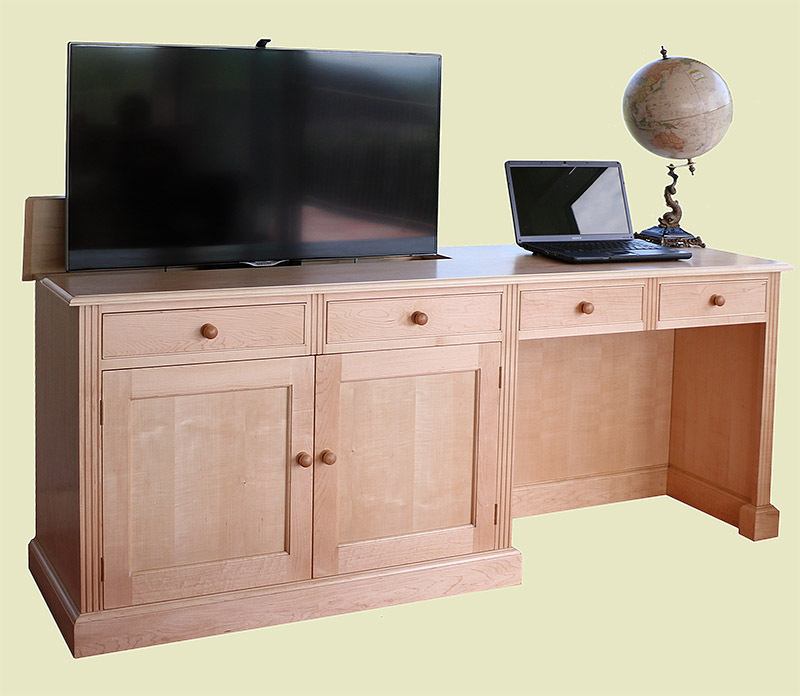 Operated by remote control, or manually underneath the desk top, the TV emerges from the rear of the cupboard section. The maple lid opens and closes automatically with the lift mechanism. And the bonus is, there's still room in front for a pair of shallow drawers, as well as a useful shelved cupboard space. The back panel in the desk section is easily removable, to gain access to the shallow void behind, to the aerial and power points. Similarly, inside the cupboard section, the back panel removes to reach the TV lift mechanism. As a guide to costs, the TV desk above was just under £5,000, including remote controlled TV lift, VAT and delivery. Here's what our client had to say: "We are absolutely thrilled with the unit. Thank you so much. It is so pleasing to have a bespoke piece of furniture that meets exactly our requirements and consequently looks great in the room. Before receiving the desk, we were singing your praises to friends...so I am sure in due course you will be receiving inquiries from our mates.Thank you again for a terrific job and great service and should we find we have more furniture "needs" we will be in touch." Moving away from maple and back to oak, we were asked by another client to make a lamp table incorporating a slab of bevelled edged granite. We are calling it a lamp table, but it's actually merely a device for our client to rest their cup of coffee when working at their desk! 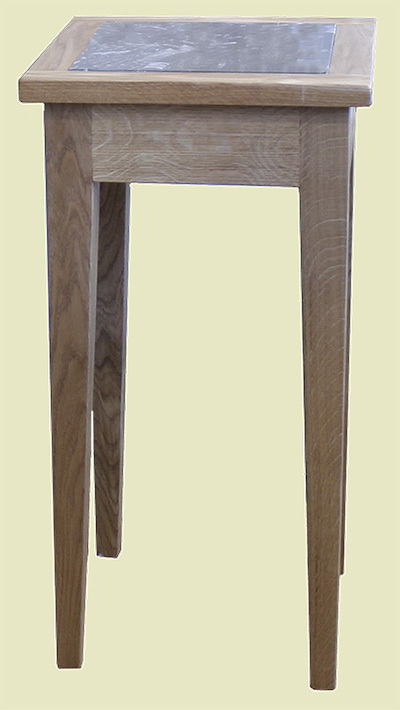 A simple design, with slender tapered legs. 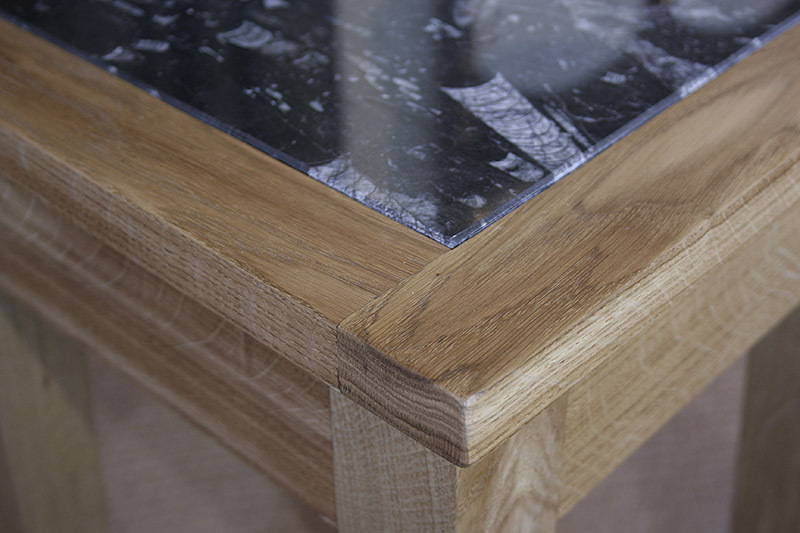 Below is a close up shot of the top corner of the 'lamp table', showing the precision jointing, 'clean oak' and attention to detail, where the tiny bevelled edge of the granite protrudes just above the oak frame. 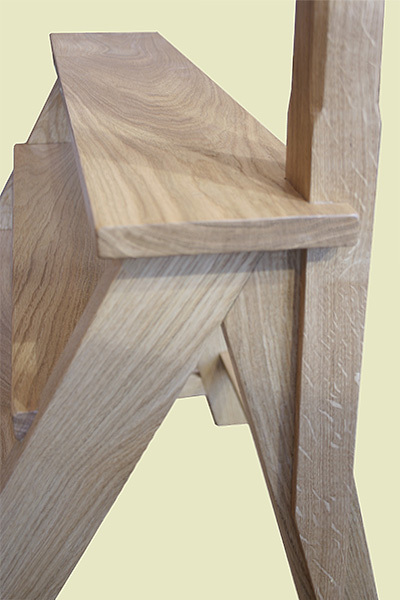 As a guide to costs, the oak 'lamp' table above was £650 including VAT and delivery. 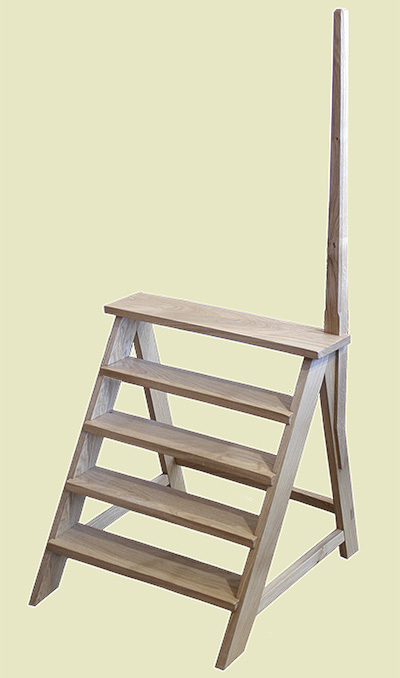 Still on the theme of contemporary oak, but with a hint of traditional, can be seen in the library steps below. As with the lamp table, discussed above, and indeed any furniture requested in our 'As New' ageing option, we will select cleaner, more 'joinery grade' oak. Still with an interesting grain pattern, but no knots, splits or shakes. Detail photo below of the library steps, showing clean crisp and dead flat surfaces. You can also see the lighter flecks of the medullary rays. These are where the tangential rays of the oak tree, emerge from the cut surface, and are an attractive feature of (and virtually unique to) English and European oak (quercus robur). As a guide to costs, the library steps above, were £780 including VAT and delivery. 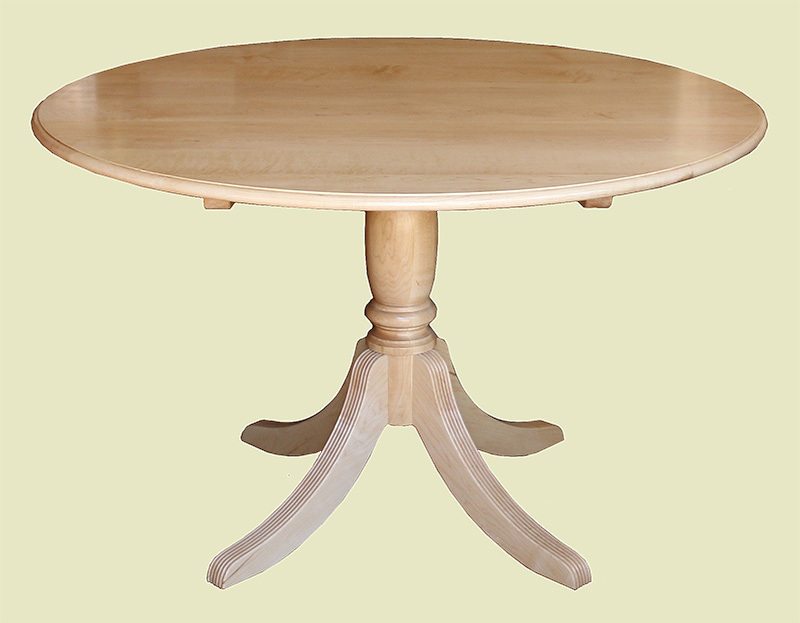 Our 'maple desk' client also commissioned a small round dining table, standing on a simple baluster turned pedestal support, on shaped fluted legs. Again, we took account of their comments, whilst in our showroom, regarding their preferences for edge moulding and thickness of top. This was priced similarly, to our equivalent period style small circular oak dining table, at £1,726 including VAT and delivery. All the pieces featured here have been un-aged (obviously!) and left in their natural colour. The wood surfaces have been fine sanded, sealed (tops with a heat resistant sealer) and then clear waxed. So there you are. When asked, we can occasionally re-adjust our brains (and hands), from the 16th and 17th century, to the 21st!